Even the most experienced sales professional will face a phase where his sales numbers stagnate. But, by forming consistent and effective work habits, he can grow sales and propel retention numbers. 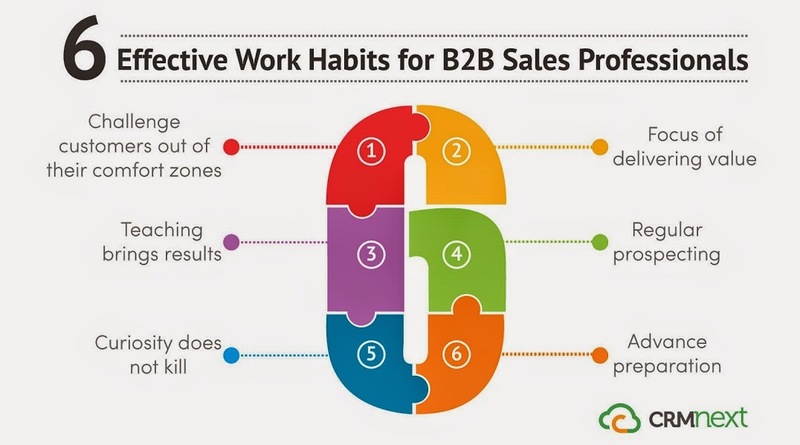 Which work habits can guarantee maximum success to B2B Sales Professionals? People love their comfort zones. However, such zones prevent them from experiencing new products or services. In order to encourage prospects to try new services, sales maestros make it their work habit to challenge them out of their self-made comfort zones. Such endeavors help build inter-personal skills and ease complex technology sales. However, it is critical that you use constructive debate to nudge the customers in the right way. Challenge conventional thinking and showcase your product/service benefits to break prospect’s fear of trying out new things. Today’s market place is inundated with sellers blandly selling products and services. Showcasing benefits over competitors is not enough anymore. In order to get ahead of competition, you should make it a habit to put in takeaways for your prospects or customers in every conversation (be it via mail, call, meetings, collaterals etc.). This will create a positive impression in the minds of the customer and make him eager for your next meeting. Being proactive is one of the first steps in generating value. It means do not wait for the customer to point out that your pricing is higher than peers. Explain to him beforehand the value generated at the corresponding price points. Delivering value often encompasses keeping customer satisfaction ratings high. Getting insights from their product/service (very effective in sales CRM). Key facts that help customers in their competition. Ways to save money and even generate maximum revenue. Key pain areas that prospects aren’t aware of. It is a simple and universal fact that without regular prospecting, your sales pipelines dry up. Do not wait for special moments for prospecting. Inculcate a regular habit of initiating new conversations with important decision makers, consistent follow-ups with leads, networking for special introductions and references, visiting trade shows and corporate events for exposure etc. It doesn’t matter whether your lead pipeline is empty or full, regular prospecting will keep you on your toes working on new leads. For saving time and automating major prospecting tasks, ensure that you use a CRM software for sales. The adage ‘curiosity killed the cat’ does not apply if you want to be the best sales person. If you aren’t confident about your product/service, how can you expect your prospects to be confident about the same? The best B2B sales professionals are always curious to know more information about their industry, products and services. They stay updated with the latest trends, new features; promotional schemes etc. and educate their customers about the same. Centralized knowledge management powered by a CRM solution plays a key role in training sales professionals. The more you know, the more confident you will be while prospecting. Prospects will consider you an expert and industry insider. It pays if you plan your activities before. You can use your task manager provide by sales CRM to plan out your daily activities, conduct research on leads and prospects, map out competitor strategies etc. Insightful CRM analytics can aid you a great deal for planning and execution. Make it a regular work habit to read business news, articles, do participant research for meetings etc. Preparing your scripts in advance can also help to increase your confidence during the actual sales meet. You can use customize templates provide in your CRM software to practice with your colleagues or manager. The above habits are critical to a B2B sales professional’s success to help their clients beat competition and be the star performer in their organization.